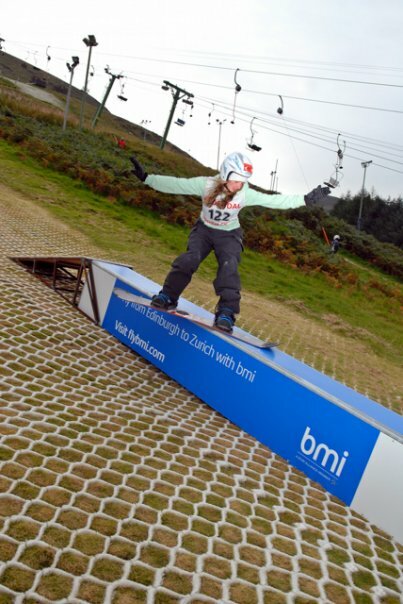 ¨I just thought id tell you i came second in my first slopestyle event last month!!! at Hillend Edinburgh! id never ridden a dry slope until the day of the comp so it was a little scary!!! I only went to the comp to watch with some friends!! but they entered me! i didnt have any gear with me at all! had to get hire kit (hence the childs helmet!!!) and learn to ride dryslope in two hours…. still have the pretty patterns on my knees! the rails were on dendex….which i hate but the kicker was made from snow flex which isnt to bad… apart from it burning though to your skin when you fall at high speed!!! next comp is november 1st at glasgow… but more scared this time because i know im going!!! we had two runs in the morning and best riders from each group went through to the finals, then you had two runs in the final too. best run out of the two counted i think. when i got there, there were no girls about so niki said i should give it ago, as if none turned up i would still get some prizes! we managed to get hold of free hire board and boots from a very nice man in the hire place, a friend of nikis found some board pants in his locker and the photographer lent me some gloves! then i went out to ride plastic for the first time!!! Hey, I have a story up on AOL Outdoors Fanhouse (outdoorsfanhouse.com) called “Are Girls Worth Equal Pay” about the X Games offering women extra prize money. Would like to know your comments on the story. Don’t know when they will change the headline story, so keep scrolling until you find it. I couldn’t make that link work, is it correct Wina? Well, those are my thoughts anyway.